One morning, in lieu of breakfast at the hotel, Sami organised a group breakfast at Balthazar. 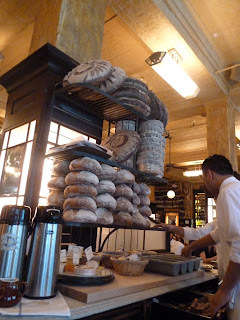 I was very happy when I found out that we would be dining at Balthazar (just before departing for the US trip). It is a very well known French bistro and I was looking forward to some French style breakfast. Balthazar is on Spring Street and is about 6 blocks away from our hotel. Unfortunately there was some scaffolding in the bistro front so I couldn't get a decent front photo. But when I walked in, it did feel like I was in Paris. The decor and the vibe was very Parisian. The waiters were attired in a French manner and the place was busy for a weekday. We were given a list of breakfast options and I chose the Brioche French Toast with Applewood Smoked Bacon. Other options available were for example Homemade Granola with Fresh Fruit & Yoghurt, Roasted Pepper and Caramelised Onion Quiche. Being a large group, we were split into 2 tables so I was unable to take any more food photos than what was in front of me. But the consensus by the group was that all were happy with their choices and that the food was delicious. Verdict: I was a happy diner and would definitely return for more (if I could).